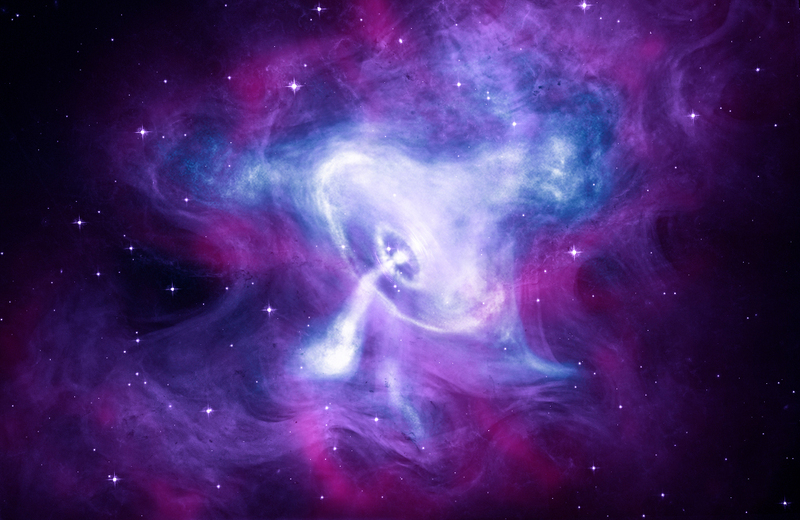 The Crab Nebula is cataloged as M1, the first object on Charles Messier’s famous list of things which are not comets. In fact, the Crab is now known to be a supernova remnant, expanding debris from the death explosion of a massive star. This intriguing false-color image combines data from space-based observatories, Chandra, Hubble, and Spitzer, to explore the debris cloud in X-rays (blue-white), optical (purple), and infrared (pink) light. One of the most exotic objects known to modern astronomers, the Crab Pulsar, a neutron star spinning 30 times a second, is the bright spot near picture center. Like a cosmic dynamo, this collapsed remnant of the stellar core powers the Crab’s emission across the electromagnetic spectrum. Spanning about 12 light-years, the Crab Nebula is 6,500 light-years away in the constellation Taurus. Posted on Saturday, 17 March 2018 by VGC	This entry was posted in ifttt-photograph and tagged IFTTT, NASA. Bookmark the permalink.